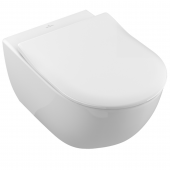 The DirectFlush WCs offer improved hygiene and easy cleaning since it is rimless. Instead of having a traditional apron and flushing rim as in conventional toilets, the DirectFlush toilets only have an apron that prevents high-pressure spraying. As a result, the area below can be easily cleaned. The innovative water flow system flushes the entire toilet bowl. The DirectFlush WCs are particularly practical as a set. With them you can get your DirectFlush toilet into the bathroom quickly and without much work in planning. The sets contain the toilet, the matching toilet seat as well as the fixing material (please make sure that the fixing material is included before purchasing the respective set). Usually it is the concealed attachment. 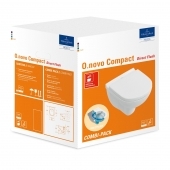 The O.novo toilets are even offered as a set with a pre-wall element and a matching push plate. 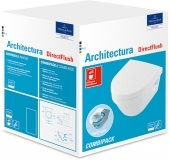 The flush toilets with DirectFlush from Villeroy & Boch are also available as a set. Just look for your favourite design and forget about having to search for the matching toilet seat. WHAT ARE THE ADVANTAGES OF DIRECTFLUSH? The DirectFlush WCs enable simple and quick cleaning in every corner of the toilet. The optional combination with AntiBac and / or CeramicPlus (C +) enhances this effect and improves the ease of cleaning and hygiene. Thanks to the efficient water supply, the entire basin is flushed without splashing and with a lower water consumption of only 3/4.5 l per flush. In addition, the DirectFlush WCs have an attractive design and are available in over twenty models. You’ll certainly find the WC that will perfectly fit your taste and bathroom design. WHICH WC SETS WITH DIRECTFLUSH ARE AVAILABLE? 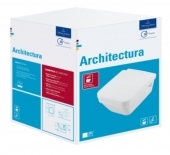 Villeroy & Boch offers DirectFlush technology with over 20 toilet variants in nine series, including Subway 2.0, Legato, Avento and Venticello. The toilets of the individual series differ in design. While the Subway 2.0 toilets, for example, have a round basic shape, the Venticello toilets have a square basic shape with rounded corners. 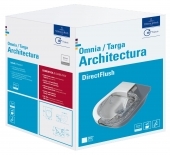 The Directflush toilets are also available in different versions. You can choose between floor-standing or wall-mounted and comfort or compact equipment. The compact versions have a shallower depth and well suited for smaller bathrooms; the comfort versions are larger than conventional toilets. Sometimes you can also choose between white, star white and Pergamon color. Many of the toilet seats are equipped with the QuickRelease and/or SoftClose function for extra comfort. Thanks to the QuickRelease function, the seat can be easily removed for cleaning and the SoftClosing ensures a quiet automatic closing after briefly tapping the lid. Some of the sets also have a Slim-Seat, which is particularly flat and fits perfectly into the overall design.